No greater than 2.00m (6’7” approx) to your rear garden. Checking your boundaries – double check the boundaries of your property; if the old fence belongs to you, you are responsible for the upkeep. It is advisable to discuss any plans with your neighbour as it is easier to install a fence when you can work from both sides. If you find out that the fence belongs to your neighbour and they won’t allow you to replace it, you can still erect another alongside it, provided it is on your side of the boundary. Choose the style of fencing you like – there are various styles of fencing to choose from, overlap/waney and featherboard panels, trellis etc., these are all handmade by us, so please contact us for details. You also have the option of using wooden or concrete posts, plus concrete gravel boards. For every wooden post you plan to use you will also need a post cap. Remember you need approximately a 2ft longer post than the finished height of your fence, ie: 6ft high fence requires an 8ft high post. Concrete posts offer a stronger, totally rot free alternative. Using either a 6” or 12” deep concrete gravel board, in conjunction with the slotted concrete posts, this allows the panel to sit on top of the gravel board thus avoiding direct contact with the damp ground, and prolonging the life of your fence. The gravel boards and concrete posts are manufacturered by us and are available in different designs and are also available in different colour. Please make enquiries if you are interested in these. Prepare the area first – remove any other fencing and plants along the boundary. Mark the boundary line using a strong piece of string or builder’s line; this will also keep the fence as straight as possible. Dig the first fence post hole – If you have a fixed point for one end of the fence, ie: house or garage etc., start from there. 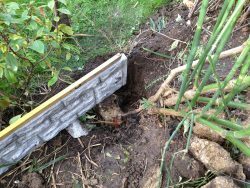 Usually, it is not advisable to dig into the footings of your property, so secure a wall plate or post to the property to start, and come off that with a panel, and then continue with your posts. If using concrete posts and gravel boards, there are clips that can support the gravel board onto timber to start and then continue with concrete posts from thereon in. Other methods are available and contact us to discuss them further if you are in any doubt. The hole needs to be approximately 600mm (2ft) deep, depending on ground conditions and height of the fence. Make it roughly a spades width wide so you have space to put concrete around all sides of the post. Place the fence post into the hole, and wedge with pieces of rubble etc, or you can compact concrete in straight away. Using a spirit level ensure that the post is upright, both ways, and in line with your string line. If the post is wedged securely enough you will not need to concrete it in immediately. Take a 6ft piece of timber or a measure (or anything you have to hand that is 6ft long) and lay it down on the ground from the first post to indicate where the next post should be dug. Dig the second hole, and then you are ready to put up the first panel. Remember do not put the soil etc., from the hole in the way of the line of your fence. Putting up the panel – You can now attach the panel to the first post. If using timber posts, you can either use panel clips, attaching them first to the post and then the panel, spacing them evenly on the panel/post. You can also just screw/nail the panel to the post, you may find it easier to drill pilot holes as this can prevent splitting the batten on the fence panels. Then place the second post into its hole and secure to the first panel, ensuring that the post is straight, using a spirit level. Again wedging the post will help keep it stable. If you are using a concrete gravel board in conjunction with the concrete post, place this on the ground first slotting it into the post, ensuring that it is firmly in place. You must also check that the gravel board is level and straight. Then place the panel on top of the gravel board, again slotting it into the post firmly. Then getting the next concrete post put it into its hole ensuring that it is firmly fitting the panel and gravel board. Again check to ensure that the second concrete post is straight using a spirit level, you then can wedge the post securely with rubble etc., Once it is firm you can then carry on with the digging of the next hole and continue putting the fence up in the same way, repeating the above procedure. Mixing the concrete for the fence posts – For one post hole you will need approximately 25kg of mixed sharp sand & ballast, mixed with cement at a ratio of 5:1 Cement comes in 25kg bags therefore you need 5kgs of cement to each bag of ballast. Obviously the quantity of concrete is very much based on the size of hole you have created. To mix the concrete using a wheelbarrow and shovel mix the cement and ballast together whilst dry, then add the water. You want to create a mixture that is the consistency of thick porridge. Check once more the vertical position of the post, and then put the concrete into the hole with the shovel. Using a old piece of timber etc., compact the concrete in the hole ensuring it fills all the gaps around the post and rubble which is holding up the post, keep checking the position of the post and adjust accordingly. Slope the top of the concrete away from the post slightly to prevent water laying against the posts. There is also the option of using a “postmix” product, where you need to follow the instructions on the bag, however this will work out more expensive than using the concrete as above. Cutting fence panels to size – Have some spare pieces of batten available (which you can purchase from us) mark the panel to the required width and nail a batten either side of the panel (create a sandwich effect) then cut down the unwanted edge of the panel using the batten as a guideline. If using a handsaw it may jam several times, using a circular saw or a jigsaw will be easier, take great care when using any power tools. Alternatively we offer a service of making part panels to your requirements, so if you wish we can make the panel for you, please contact us if required. 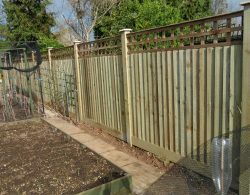 Concrete Posts & Gravel boards are heavy, as are the larger fence panels – therefore it is recommended that 2 people should carry out a fencing project. Remember to check for any electrical cable or pipes before digging your holes. Ideally use a 100 x 100 timber post for 6ft high fencing or over, and 75 x 75 for anything under, again it does depend on the type of panel being used. Post caps – apply some silicone based adhesive to the cap before nailing it to the post, pre-drilling the post cap and also stop them from splitting. Slope the top of the concrete away from the post slightly, to prevent water lying against the post. If just replacing the panels, check the width size of the panel carefully, most panels are 1.83m (6ft) wide but there are some on the market that are only 1.8m (just under 71”) wide and this could cause you a problem with existing posts in place. LAST TIP IF YOU’RE NOT SURE ASK – we are only a phone call away if you are in any doubt or if you need any advice, we are happy to help. The above information is given in good faith, but for guidance only, and we cannot be held responsible for any problems that might occur.